The Main Level is representative of the Georgian style. The generous volume of the public rooms provide a perfect setting for entertaining on a grand and elegant scale. Hardwood floors, ornate cornices & wainscot paneling, tall ceilings and wide doorways. 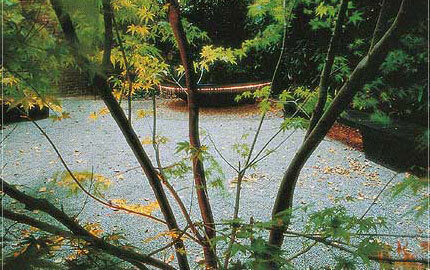 Large windows let in an abundance of light from all levels and the north facing rooms look over the Zen Garden. The house has been beautifully maintained and is in move-in condition. Walk to nearby Fillmore Street shopping, dining & entertainment and to Lafayette & Alta Plaza Parks. The tranquil Zen Garden is a place for quiet contemplation It was designed by renowned landscape architect Topher Delaney of T. Delaney Inc./Seam Studio. 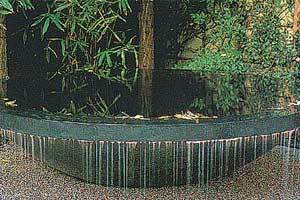 The centerpiece of the garden is the alluring black fountain bowl, surrounded by the shimmering greenery of towering poplars, tall bamboos, and a delicate Japanese maple tree, set in a sea of white gravel with black slab bench seating. The expansive FOYER features ornate cornice work and a delicate frieze on the ceiling. The handsome staircase is framed by a pair of Ionic columns, wainscot paneling and two sets of the beautiful stained glass windows. 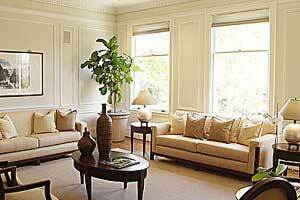 The gracious LIVING ROOM features a marble fireplace and deep crown molding. 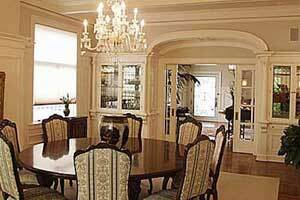 The formal DINING ROOM has a beamed ceiling with chandelier and built-in china cabinets. It can seat a major dinner party with ease. French doors open to the deck overlooking the Zen Garden. The expansive KITCHEN with breakfast area was designed by well-known San Francisco architect Dan Phipps. The large kitchen windows look out to tall greenery of the bamboo. Off the foyer are the POWDER ROOM & ELEVATOR and secondary staircase with access to four levels. Ascend the staircase to the spacious second floor landing with a graceful arch over two Ionic columns. The south facing MASTER BEDROOM has a corner contemporary fireplace. The MASTER BATH with marble surround features a Jacuzzi tub, separate shower and double vanity. Adjoining DRESSING ROOM with ample wardrobe storage. Two additional sunny BEDROOMS each with adjoining tiled BATHROOMS. The handsome and spacious LIBRARY/OFFICE has an impressive box-beamed ceiling and ornate fireplace. The top floor FAMILY/MEDIA ROOM features a beamed ceiling with large skylight, fireplace, wet bar and built-in storage for an entertainment system. 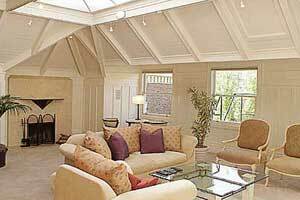 The south facing SUN ROOM has French paned windows on three sides. It is a perfect place to raise tropicals, and can double as an exercise room. French doors open to the roof with parapet on three sides. Two BEDROOMS & a shared FULL BATH complete this level. Utility/mechanical room and ample storage. Property Taxes to be reassessed upon sale to approx 1.117% of the purchase price. Property Disclosure Package available from the Listing Agents on request, and should be reviewed prior to submitting any offer to purchase the property.